The best movie I saw in 2015 is without a doubt the journalism-centered drama Spotlight. To be honest, I only chose to see it because all the other films on my list (The Revenant, The Big Short, Star Wars) were sold out on Christmas day. But wow am I glad that things worked out and that I gave this movie a chance. I would even go so far as to call this a must-see. 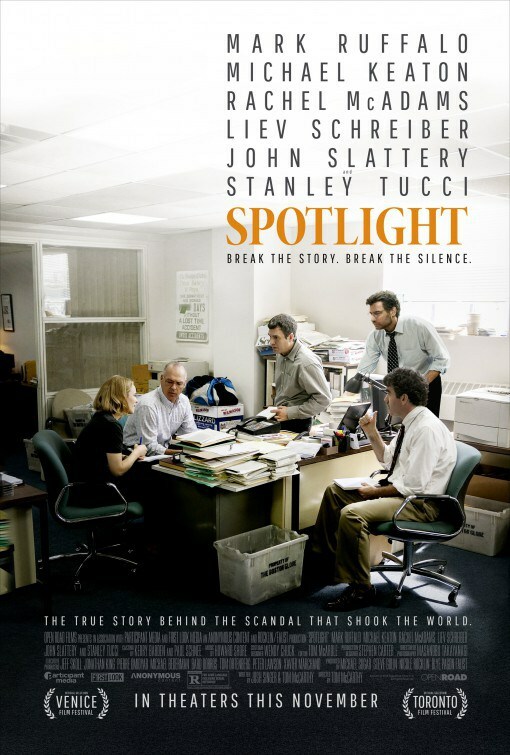 The premise for Spotlight is inevitably dark, as it centers around the Pulitzer-winning Boston Globe Spotlight team of journalists that ultimately uncovered the worldwide issue of child molestation among priests in the early 2000s. It'll probably be a difficult film to watch for those of you who identify with Catholicism or are sensitive to the subject of child abuse. But the movie manages to not get weighted down by the depressing details of its subject matter, and manages instead to focus on its committed journalism team and on the issue of how community, specifically the big-small-town community of Boston, plays a role in tragedies like this. The movie plays out over the period of a year, as the Spotlight team is first assigned this topic, then proceeds to exhaustively research and conduct interviews against the body of religion and politics working to hide the truth. It doesn't sound like an engaging story, but it is, and you're made to root for every reveal by every member of the team. Aside from a short intro sequence at the start of the movie that takes place in the 1970s, the film takes place solely in the year when the team does their research. There are no cheesy flashbacks or dramatized scenes - moments are described by victims directly. It's that odd period piece from the early 2000s that feels both current and in the past - there's nothing like seeing massive IBM machines or AOL posters to make you realize this is a different era, but not one so far back from our own. The performances are terrific, and I'm sure there'll be at least a couple Oscar nominations. I loved Michael Keaton, who gave a solid, yet mellow and understated turn as the thoughtful leader of Spotlight. Mark Ruffalo was the only miss for me. He was given the most to work with in terms of adrenaline-fueled chase scenes and emotional confessions, the stuff that makes Oscar contenders, and yet his overacting was a sore spot on my screen. There's people that become a character, and then there's people that act a character, and he was well on the latter's side. That said, since he's a popular, well-connected Hollywood star I'm thinking he'll get nominated despite that. I'm just frankly disappointed. As someone who lived for two years in Boston, I also found it fascinating to see this movie's portrayal of the city and all the unfortunate negatives within it. It's both a love story and an indictment of Boston, with beautifully shot scenery but a message that hints at what's hidden beneath the small town feel. If you have a chance, go out and see this movie, it's well worth your time.